Here's a screen shot of what the Google Maps camera notification looks like in England. The speed cameras are marked in orange. Google has no intention of backing down on what the NYPD believes is a “criminal” effort to help drivers learn the locations of police enforcement checkpoints and speed cameras — because the tech giant thinks it’s best suited to improve public safety. The NYPD disagreed with the company’s “belief” in the safety efficacy of alerting drivers to what Google refers to as “speed traps,” but pedestrians, cyclists and law-abiding drivers call safety measures. “If people are speeding through areas that don’t have speed cameras because they are able to avoid areas that do, that is a significant public safety concern,” said NYPD spokesman Phil Walzak. How Streetsblog broke the story. Google declined to answer any follow-up questions from Streetsblog. 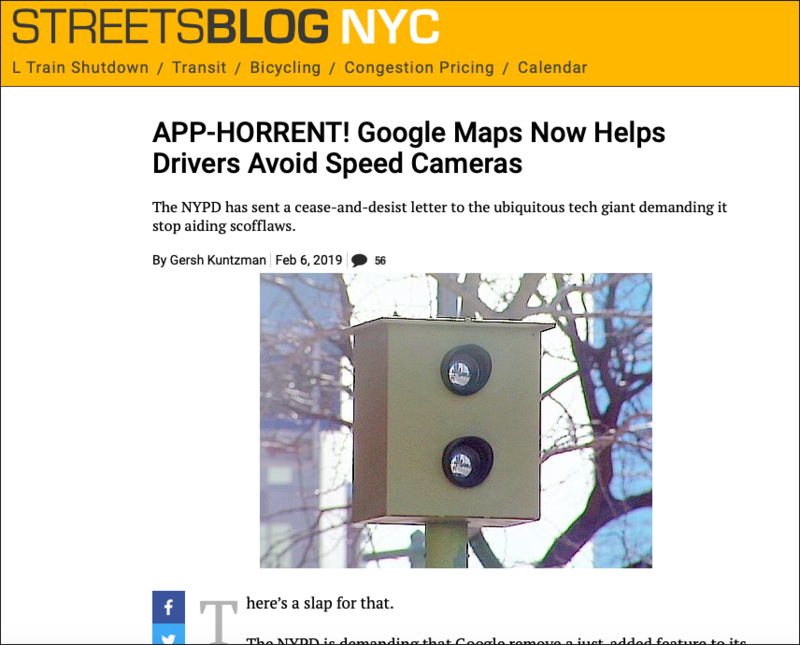 The company’s statement came hours after Streetsblog reported on details of Google’s latest Maps feature — which shows the locations of speed cameras — and the NYPD’s hostile reaction to the app, which led the agency’s chief legal officer to write a cease-and-desist letter to Google over the weekend. That letter has not been answered, Walzak said. The Streetsblog report has prompted national coverage and discussion. NBC News did a segment on the NYPD letter to Google, and scores of comments filled the Streetsblog story, with some defending Google, but others pointing out the gray areas in what normally would be a straightforward debate about how best to enforce posted speed limits. “It’s very simple,” posted one reader who gave only the name Andrew. “If the goal of speed cameras is to reduce speeding at a handful of locations that have cameras, then announcing the presence of those cameras is a good idea. If the goal of speed cameras is to reduce speeding everywhere, at far more locations than there can possibly be cameras, then announcing the presence of cameras is a bad idea. Fellow reader Ferdinand Cesarano added his concern that the app would merely “lead drivers to avoid routes with cameras,” which would enable more speeding.